CONNECTING MAKERS AND CHANGEMAKERS FOR A BETTER WORLD. Providing a platform for meaningful exchange and cross-collaboration, MKR City expands the use of the word “Maker” to include individuals working to build their communities and neighborhoods in resourceful and often astonishing ways. From visual artists, to musicians, to barbers, to physicists, to inventive mowers-of-lawns, to homemakers, to city-planners and developers, MKR City exists to connect visionaries in infinite fields, united by the desire to create social, cultural and economic value while fostering the common good. Maker City exists to forge new collaborations and opportunities for Makers and ChangeMakers. We were thrilled to bring Vincent McWilliams and Ivan Moshchuk together to create an original musical composition. Ivan Moshchuk has been playing piano publicly since he was a young teenager. Born in Russia and raised in Grosse Pointe, Moshchuk became the first Michigan artist to win the Gilmore Young Artists award in 2010. He's since gone on to perform in concert halls around the world. Photo by Lisa Spindler. Vincent McWilliams created his clothing line, Kill the Hate, to encourage every individual to let the hate inside themselves “die daily”. 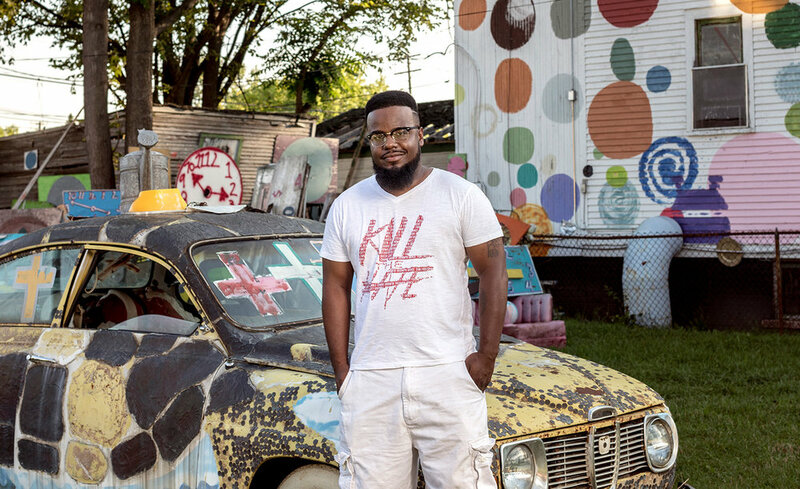 Designed and made in Detroit, his line has been effective, especially among young people, in de-escalating arguments and sparking conversation. Detroit is evolving. The drivers of change are artists, entrepreneurs, and leaders, all working tirelessly on their respective missions. Supper'D's mission is to bring together entrepreneurial and community-minded Detroiters who may currently be working in silos. They aim to discuss inclusive entrepreneurship and community-improvement. By bringing folks from different walks of life together in intimate settings, they hope to help initiate meaningful conversation that will help grow their individual businesses, networks, and initiatives while collectively catalyzing growth in Detroit. The community they create will provide support and resources. In addition, they want Supper'D to be a means for civic engagement.